Colin Kawakami has worked in the game industry for nearly twenty years. A complex and dangerous man, Colin is held in dark regard because of his haunted, mysterious past. 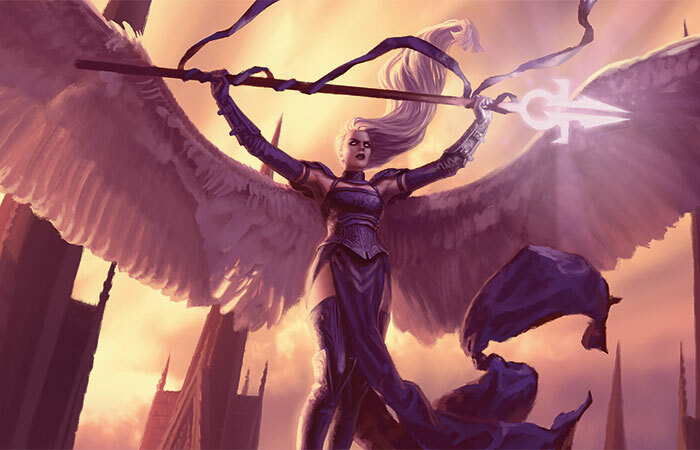 On the plane of Innistrad, the angel Avacyn has returned to guide her faithful worshipers, pushing back the darkness that ruled the plane while she was sealed away. The plane's monsters are in retreat, the church is resurgent, and everywhere humanity is stepping back into the light. It has been years since I have held a quill, but I am compelled to record the terrible secret I have discovered, and how it came to my hands. I would be killed for this heresy, and although I have no fear of death, it may be a preferable fate. For this is madness, surely, a vacuum of truth where I am now sealed. I am Dovid, once a cathar of the Pale, grievously wounded at the battle of Child's Wall, now comitant to the angels of the Lofts. My memories of the battle are only pieces—the shattered blade of my hanger as I wrenched it from a living corpse; the taste of my own blood as I fell; a silence in which I knew death was certain; and then a blinding light when, at last, Avacyn appeared. My right arm was a hideous ruin and I was triaged to the cathedral courtyard, where I lay feverish under a canvas tent, visited by a cleric who became more optimistic each morning he found me still breathing. At first, I was unable to move, but even as the cries of victory echoed against the high stone walls, I simply lacked the will. I would have lain there forever, had she not come for me. The moans of the wounded became like the coos of babies comforted by their mothers. I had been numb to all care, but even before I heard her voice something stirred within me, and I turned my face to the sky. Avacyn was there, flanked by a minor angel of the Flight of Herons. "You have given us hard service, and suffered more than most, but we have further need of you. Stand now, Dovid of the Pale." Her voice was without tenderness, yet I was filled with love, and I rose as if weightless. 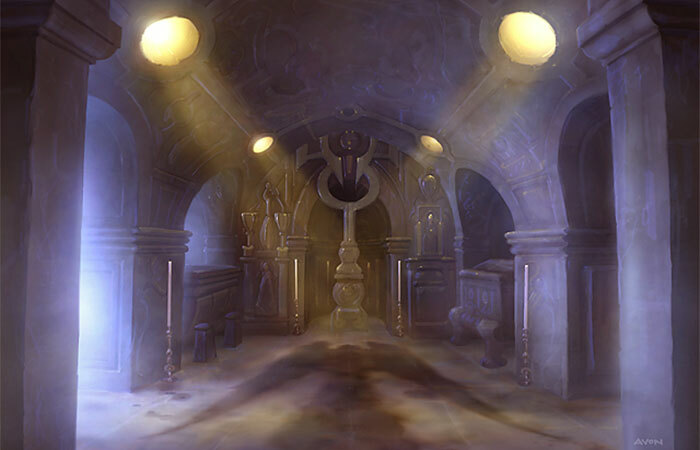 "The Lofts of Thraben Cathedral have long been abandoned, but we will soon return. You, and you alone, must prepare that space previously forbidden. Could you refuse us?" I shook my head, slowly, then caught myself. "No, never. I am your servant, and your will is mine." Her eyes were like pearls too beautiful to behold. "So it is. This is Gryta." 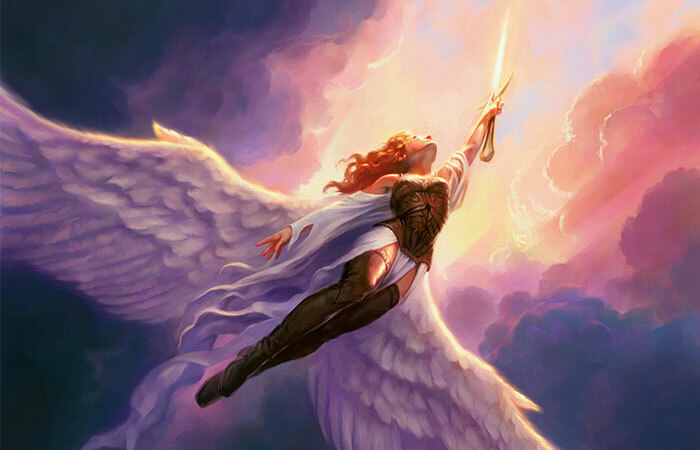 The angel at her side stepped forward, a full head shorter than Avacyn, yet I still tilted my head to look upon her face. "She will show you the way, and relay our instructions in the days to come." 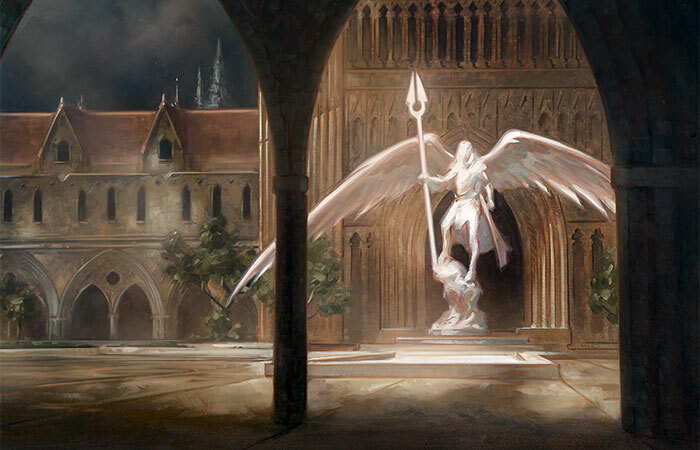 And without pause or ceremony, Avacyn took to wing, silently, like an owl. Gryta regarded me with the curiosity that one might give to a piece of fruit with a unique deformity. "So, Cathar, do you know that spot, high on the wall where there should be a window?" She gestured with her wing, and I saw it at once: a single arch, bricked over. "Meet me there and I will show you how to enter the Lofts." There was a rush of air, and then she too was in the air far above me. That is how I became Comitant Dovid. It is strange how the position has distanced me from the cathars and other officials of the church. I'm envied at least as much as I am honored, and mistrusted as much as I am respected. 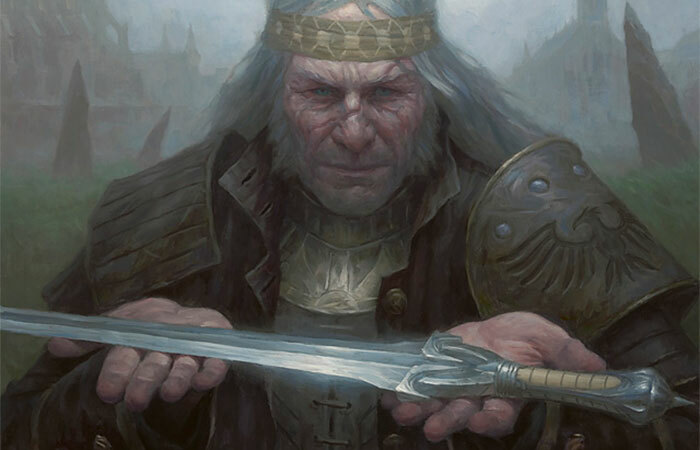 I carry the first sword forged from the remains of the Helvault, and I walk the upper halls of Thraben like a ghost. There are times when I go for days without speaking a single word aloud. The angels are wondrous and powerful beings, but it is in the presence of their beauty where I am the most alone. In the Lofts, they sing wordlessly, their voices like chimes. The Flights have separate mantras which can't be spoken with a human tongue, a sound I have often mistaken for rain. We find them easy to worship, and their power and beauty make it so, but they are not like us, you see, in any way other than form. For all the adulation we give to them, they are further from us than we are from an otter or a wren. Perhaps our adulation is what makes it so. It is only Gryta who speaks to me, and although her speech is flawless, I've come to believe that it's something she does deliberately, with great effort. I'm foolish to think that she favors me, but even now part of me believes it's true. On that first day, I searched for hours before finding the stairs that led me to the high rampart where Gryta waited. It was a sheer drop without a rail, and as I forced myself to look upon her, the fear must have been plain on my face. "You will not fall, Dovid." Her eyes were deep brown and seemed wholly human. "Or, if you fall, I will catch you. Lay your hands upon these stones, here and here." I did as she directed, and she murmured in the angelic tongue, something like an echo, or a coin spun inside a bottle. The bricked window folded into itself silently, and it seemed as natural as the opening of a door. "There are many ways to enter the Lofts from inside the cathedral, and all of them will recognize you now." I expected the air to be stale, but it was light and sweet. "Clear the cistern first. I will know when you have finished." I turned to acknowledge her command, maybe stammer some thanks, but she was already falling, tumbling toward the ground before shooting aloft again, over the roof, then gone. 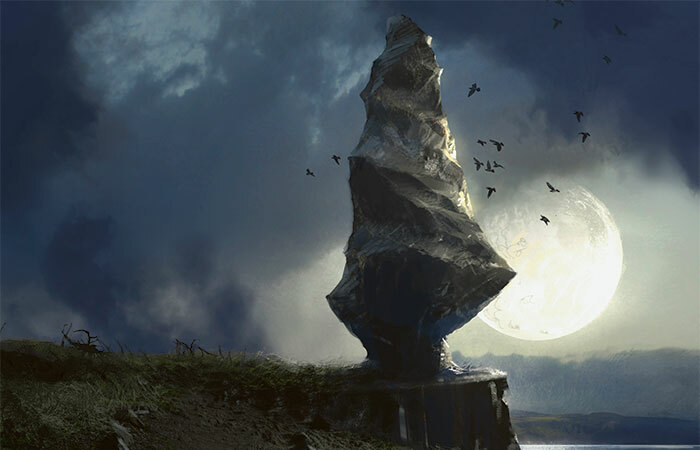 The fragments of Helvault were collected after it split, and the raw silver ore was distributed among the most distinguished lunar smiths. A family of swords were forged from that metal, and Gryta dictated a list of names she had received from Avacyn, persons who were to be honored at a fete where the Flights presided. When we were finished, Gryta added in what seemed like an afterthought, "And your name as well, Dovid. Put it at the top." Mine is a mortuary sword, with a sculpted basket where the wings of Avacyn's visage reach into the ricasso. Between those wings my sword's name is etched: Eost. I have drawn it only once, during the ceremony where it was presented to me, when Avacyn touched its point. It is as light as air, and sharp enough to halve a river stone, but I doubt I will ever wield it. My arm is near useless, and I am cloistered here. Eost rests in a case above my desk, but I found my eye had strayed again to the source of my torment. Below my sword, and next to the journal in which I now write is another, remarkably similar, written in a precise and feminine hand. 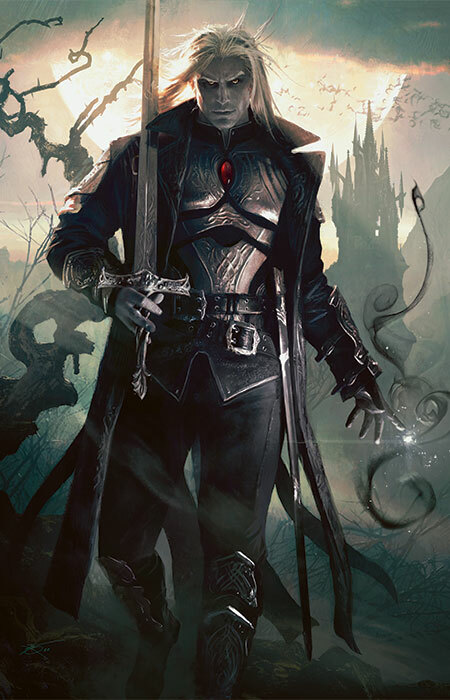 The frontispiece is an exquisite illumination of Avacyn's collar, and on the opposite page is a name: Mikaeus Cecani, Lunarch. The Lofts were in good repair, and the spirits that haunted them during the angels' absence fled from me when I entered. The cistern is massive, and when Gryta commanded me to clear it, I imagined that its source would be somehow obstructed. Instead, I found it filled with clear water, lit from within and glowing like the face of the moon. Half submerged in the basin was the body of a man dressed in black, and I knew it was what I had been sent for. He had been strangled, and although there were no signs of rot, he was murdered some time before, but was then preserved by the waters of the Lofts. When I wrestled him onto the cool stone, the book was dislodged from inside his coat. I had no way to know what it contained, who had been its author, or why it was there in the possession of a dead man, and I was filled with dread. Something had been interrupted there, some evil plan thwarted, and I was now its witness. I had the body sealed in a nameless crypt deep inside the catacombs and returned to my quarters with the book. The journal was bound with a spell I recognized as of the Nightfall Cathars, and a moon passed before I solved it. Initially, I was joyous to have found such an artifact, and I told myself that I would announce the discovery after I familiarized myself with its contents. 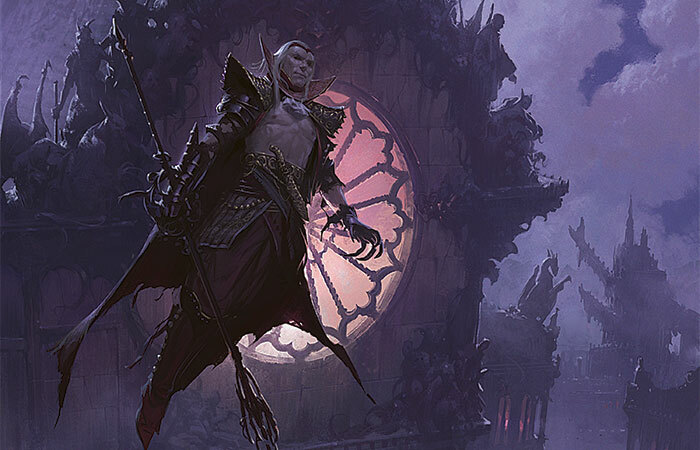 I wasn't surprised by first revelation: Avacyn had been sealed in the Helvault with the demon Griselbrand, and during that time our power had diminished. This was known only to Mikaeus and the highest Devisers, a secret they kept to prevent unrest in the congregation. But the passage that pushed me toward apostasy was far worse. ...Markov and his sons trapped the angel Marycz in his laboratory and exsanguinated her before preparing the unholy decoction that set in motion a cycle of fear and predation that we suffer under today. The curse of the vampire that we have been trained to fight was created by humans themselves. I had thought us noble, the race that carried the light against our world's evil. Were we worth defending? I worried over this even as I descended deeper into the secrets of the church Mikaeus had put down. Would I have stopped then if I knew the magnitude of deception I would find? Humans were fighting a losing battle. The vampires were simply too powerful, and after generations of multiplication, they had come to nearly outnumber us. Each battle the vampires won, each human life they took, served to weaken them, whereas our own victories were victories for us both. This war was not between human and vampire. We were allies against a common foe: the vampires' own hunger. It is a cruel symmetry that our salvation was born of the Markov family, S. Markov, a creature so ancient and powerful that he survives even today. 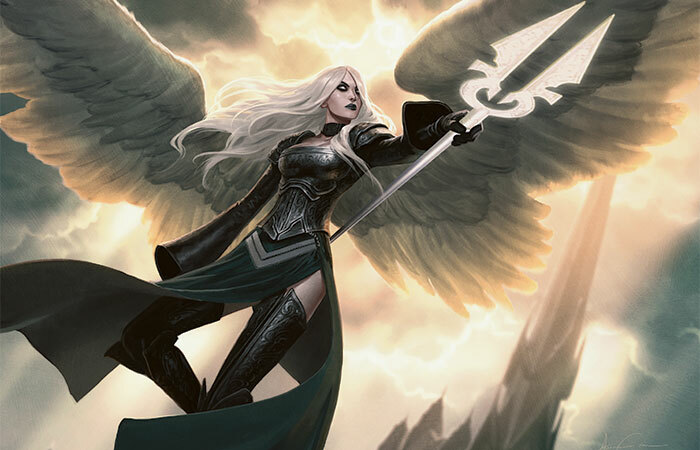 Seeing that our destruction and theirs were inexorably linked, Sorin created Avacyn, a force to rally our remaining angels, a force that we could unite under. A force constructed to hold in check the very vampires who created her. We are livestock. We are unwitting participants in our own cultivation. The church to which I have dedicated my life, the being that I have loved since birth, the boundaries of my world, all of it is a sinister lie. How strange this world is, and how cruel.